The choice of the representative for the Eurovision Song Contest in Belgium is shared by two television stations and alternates year by year: Wallonia and Flanders. This year Wallonia has chosen an Elvis imitator named Patrick Ouchène who will bring back the golden days of Rock’n Roll to Eurovision. The symbol in the video clip is an animated cat which is also the title of the song “Copycat”. 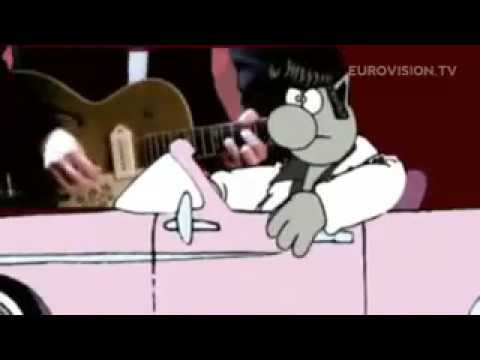 This is nothing new in the contest, the song has also similarities in the arrangement to this years German song “Miss Kiss Kiss Bang” and Rock’n Roll has never been highly appreciated by the televoters and juries. Furthermore the cat looks a bit like the logo cat from the 1990 Eurovision Song Contest in Zagreb called “Eurocat”. So nothing is really new from Belgium this year. The song itself is an easy tune with a melodic verse and refrain. After last year’s entry from Belgium “O Julissi” which was a big hit in Belgium this is a step back.